Take a break - now! More than 70 Shropshire employers took the opportunity to find out more about radical changes in equality law from our Alpha Team. We organised two seminars to lift the lid on the dramatic shake-up created by the Equality Act 2010 which has just been introduced. And the employers who attended the free sessions were extremely impressed by the advice they received. John Mehtam, our Employment Law Specialist, said the new Act had brought the most significant changes in the sector for 50 years. “We wanted to help local employers understand the implications of the changes to the equality rules as failing to comply could leave them facing a host of tribunal claims and paying out a fortune in compensation. The Alpha Team were joined by leading barrister Sophie Garner, from St Phillips Chambers, for both presentations, who explained to employers what their new responsibilities are and how they could avoid expensive employment tribunal claims. The new Act includes a major overhaul of the equality rules covering discrimination, behaviour, harassment and interview techniques. Our Alpha Team supports local businesses by offering 24-hour practical employment law and HR advice from qualified lawyers from our Commercial Department. 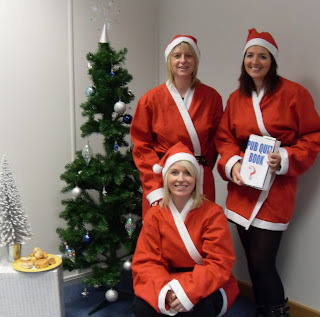 Four employees from Martin-Kaye LLP Solicitors will be spending the festive season raising vital charity cash. The fund raisers are all members of our Personal Injury Team and they will be supporting Hope House with their efforts. Lynsey Kilvert, who has organised the campaign, said they were looking forward to a whole series of challenges and events. “We’ll be kicking off our week-long campaign by taking part in the Hope House Santa Fun Run, in Oswestry, on December 12, which will be a great event to be involved in. And we will also be selling cakes at our offices on December 13, as well as holding a quiz on Wednesday, December 15, at the Hare and Hounds in Oakengates. Shropshire employers must take note of the latest radical changes in equality law if they want to avoid a host of tribunal claims. That’s the message from our Alpha Team who have organised two seminars to lift the lid on the dramatic shake-up. John Mehtam, for the team, said: “The Equality Act 2010 came into force earlier this month, and has brought the most significant changes in Employment Law for 50 years. So we are planning two free seminars on Wednesday, November 17, at our offices in Euston Way, Telford, and employers can choose from a morning or afternoon session. “We’ll explain the changes which have radically transformed the way employers deal with their staff, and help company bosses discover how to avoid the pitfalls,” said John. “We’re also extremely pleased that leading barrister Sophie Garner, from St Phillips Chambers, will be joining us for both presentations, and she will explain to delegates what their new responsibilities are, and how they can avoid expensive employment tribunal claims. Shropshire company bosses must be wary when it comes to asking about the health of any potential new employee. John Mehtam, from our Employment Law Team, said the rules had changed with the introduction of the Equality Act earlier this month. John said employers could only ask health-related questions prior to a job offer in certain circumstances. “You can ask these questions before you offer the person a job if you need to decide whether the applicant can carry out the essential duties that the role involves, such as heavy lifting. But if this is the case, you must think about reasonable adjustments which could be made to help the person carry out the role. Martin-Kaye LLP Solicitors have taken part in an international assembly of lawyers in London. We are a founder member of the IAG organisation, which gives professional firms from all over the world the opportunity to network and share business ideas. Our Senior Partner, Graham Davies, said: “It was great to be able to take part in an IAG meeting in the UK, as it’s a rare opportunity to bring members from far and wide to this country. The meetings are held all over Europe, and are an invaluable way to cement our relationships with international lawyers. During the two-day event, Graham also took part in a presentation about dispute resolution in the UK and the cost implications of taking proceedings in the UK. The assembly was held over the same weekend as the Royal Parks Half Marathon and the IAG organisation entered an 15-strong team of runners, including Martin-Kaye's Louise Clowes. “We took part in the Corporate Challenge, which requires each runner in a team to complete the full race distance of 13.1 miles – the times of the fastest six team members are then added together to find the fastest team. Shropshire employees waste more than an hour every day on social networking sites while they’re at work. And Lynsey Woolley, from our Employment Law Team, says such time wasting could cost businesses dearly unless they take action. Lynsey said the figures revealed in a poll by MyJobGroup.co.uk also showed that idling on social networking websites was costing British industry around £14 billion every year. “The social networking phenomenon has really taken off in the last few months, and more and more people are relying on it as their preferred method of communicating with friends and colleagues. Employers must ensure they make their staff fully aware of what is and is not acceptable during work hours and on their company computer or phone. Lynsey said it was also wise for employers to monitor just exactly what their staff were posting online. Shropshire business owners are being warned that breaching environmental rules can damage the reputation of their company beyond repair. She said a conviction could also mean your company’s insurance premiums would increase, and your ongoing relationship with the Environment Agency could be damaged. Louise warned that company directors should also be aware they could be disqualified from acting as a director, and breaching that order would be a criminal offence. Expectant parents across Shropshire whose babies are due from April onwards next year should be sure of their rights when it comes to time off work. New rules introduced earlier this year mean if a child is due on, or after April 3, 2011, the father or mother’s partner will be entitled to 26 weeks’ additional paternity leave. But Emma Palmer, from our Employment Team, warned that babies may not stick to expected deadlines. “The extra time off is on top of the existing two weeks’ paternity leave, which fathers can take within eight weeks of the birth, but babies are rarely on time. “The new rules will only apply to births on, or after the April date, and the additional leave can only begin once the child is 20 weeks old. But what happens if your baby arrives early? Are you still entitled to take the additional paternity leave or do you lose your right to extra time off? “The simple answer is if the original due date met the new criteria, your family will still be entitled to the additional leave – this is why the guidelines are based on the expected due date rather than the actual birth date, as it’s so difficult to predict accurately. “But remember, before you can claim the additional leave, you must have a minimum of 26 weeks’ continuous employment at the 15th week before the expected week of childbirth. If you don’t, then no matter what day the child is born, you won’t be entitled to the 26 extra weeks. You will also only be allowed to take the extra time if the mother has returned to work – you cannot both be off work at the same time. Shropshire employees are being urged to make sure they understand the finer details of their payslips and not ignore the small print. Lynsey Woolley, from our Employment Law team, said figures showed almost ten per cent of workers were unsure what some of the references meant. “There is so much confusion about payslips that the Institute of Payroll Professionals has organised a national payroll week to help make things clearer.” The week will be held from September 6 to 10, and during the week employees will be encouraged to visit their payroll department to discuss any queries they may have. She said an itemised payroll was a legal requirement, but the levels of National Insurance contributions, taxes or pension reductions, were not always easy to understand. “It’s important that employees take this opportunity to seek advice in order to monitor their pay correctly, particularly in such difficult economic times.” Lynsey said employees should also keep copies of their payslips and any other related documents, such as P60s, for at least 22 months from the end of the tax year they correspond with. Property developers who strive to make their buildings more energy efficient could find they are breaching new rules, one of our solicitors has warned. Louise Clowes, from our Commercial Property team, said several building regulations changes would be introduced later this year. Louise said the changes to the regulations would bring new requirements and guidance to make sure ventilation was increased in today’s properties. Louise said it was a difficult time for property developers, as improving energy efficiency was a valid aim, but protecting health and safety was also vital. “There are safeguards in place though, and the local authority building control body can take several actions if building work is carried out that breaches the rules. They can serve an enforcement which will allow 28 days for the work to be put right, or they can apply for an injunction for the removal or alteration of the work. And in the most severe cases, developers could face a fine of up to £5000 followed by £50 per day for each day the breach continues. Shropshire companies should embrace social networking sites in order to protect their business. Our Senior Partner, Graham Davies, said social media sites like Facebook, Twitter and Myspace had become phenomenally popular in a very short space of time. Graham said setting up a corporate profile was the best way to stop someone else setting one up first. “A competitor or company with a similar sounding name could register a Facebook profile under the listing that you would need to use. And once that was done, they’d be unlikely to give it up easily, which may leave you no option but to resort to expensive legal action. It would also prevent unhappy employees or customers having ‘fun’ at your company’s expense, so it makes sense to opt in to Facebook, if only to ensure you have the genuine profile. “According to Facebook itself, it has over 200 million active users who each have, on average, 120 friends or contacts. So the good news is that once your company decides to sign up, your name has a very strong chance of becoming more widely known. Shropshire employers will face an extra burden if the idea of axing the traditional retirement age of 65 goes ahead as planned. Lynsey Woolley, from our Alpha Team, said the Government’s plans to abolish the default retirement age, and to extend the age when employees are entitled to take their pension to 66, would bring real challenges. “The Government has been under pressure from many organisations who want the retirement age extended or removed completely. This means justifying a retirement age used by a company will be in its own hands if the default retirement age is axed, and companies will not simply be able to end an employee’s contract just because they turn 65. “It will be vital for employers to monitor staff closely, as if they are asked to retire – whatever age the employer selects – there will need to be enough evidence to back up the decision. On the positive side though, Lynsey said the decision to axe the age limit could help towards reducing age discrimination in the workplace. “It could have a dramatic impact on the way older workers are perceived, and on perceptions about their ability to contribute to the company. Green-thinking Shropshire landlords should work with tenants to reduce the environmental impact of commercial buildings across the county. Louise Clowes, from our Commercial Property Team, said by working in partnership landlords and tenants could make a huge difference. But Louise said the green clauses did not have to be part of a lease – they could also be included in the rules of the overall industrial estate, or in a general environmental policy for the building itself. Louise said there were some barriers though if landlords were considering adopting greener leases. “Generally improvements to an industrial estate introduced by a landlord are not recoverable through a service charge, and so landlords might be reluctant to spend a lot of money introducing new technologies for no financial return. Shropshire couples are being warned there’s no such thing as a “quickie” divorce. Rebecca Littleford, from our Family Team, said with domestic violence predicted to increase during the World Cup, more and more couples may face marital difficulties. Rebecca said the divorce could be speeded up if the couple were prepared to take a non-confrontational approach. Once the petition has been filed with the courts, your spouse has the opportunity to decide if they want to fight the divorce – and it’s only after they agree not to fight it, that you can apply for a Decree Nisi. "This is not a divorce, it’s just an indication from the courts that they agree in principle with the action,” said Rebecca. “In fact, apart from in some highly unusual cases, six weeks and a day must pass between Decree Nisi and Decree Absolute. It’s only once the Decree Absolute has been issued that the couple will actually be divorced. “Clearly divorce is a dramatic step, and a truly life-changing event, and even if things do get heated over the next few weeks during the World Cup, it’s important not to make any hasty decisions. Statistics show that domestic violence levels do increase during the tournament, particularly if alcohol is involved. Teamwork is the key to a successful World Cup, and not just on the football pitch, according to one of our Employment Law specialists. Tina Chander said: “Major sporting occasions can divide as well as unite workplaces, and it’s important that employers are prepared for this summer’s World Cup. Many staff members will want to watch the matches, but there will be others who have no interest in the football at all. Tina urged employers to be flexible by possibly changing the start and finish times of the working day, or allowing a longer lunch break so staff could catch the match. “Be honest and open with your staff though, and if you can’t accommodate any changes to your working practices, say so. She said employees who were unable to get to a television for a big match may well turn to the internet instead. “Make sure you are clear about your policies on this and whether you will allow it, as there is likely to be an increase in the use of social networking sites such as Facebook or Twitter, or in viewing sports news websites. Employers should prepare for some major changes in workplace rules now that the new Government is in place - that's the warning from John Mehtam, our Employment Law specialist. John said there was likely to be new protection for “whistle blowers”, in particular NHS staff who raise concerns about patient safety. And John also welcomed the news that the current employment tribunal system is to be overhauled. “There are suggestions that higher deposits will be required and that costs will be increased to prevent weak claims going forward, and to encourage mediation instead. Employers who turn a blind eye to "slave labour" working conditions could face tough prison sentences. Claire Williams, from our Alpha team, said the new Coroners and Justice Act which came into force in April, had introduced a new offence. "The offence prevents employers from holding anyone in ‘slavery’, by using threats or deception to force them to work. "And it’s a very serious offence, as any employer who is found to have knowingly ignored such a working environment could face up to 14 years in prison." Claire said the new offence was introduced largely to protect vulnerable workers, such as migrants who may have little understanding of English or employment law. "So if an employer threatened an employee with violence, or made threats to report the worker to the authorities, or made threats against the worker’s family, they could face severe consequences. The rules are a welcome introduction to employment law, but in today’s society, you would have expected that this kind of behaviour should have been outlawed decades ago. "In reality, most employers will not be affected by the changes, as they will be already complying with existing employment law and treating their employees with the appropriate respect. But there is obviously still a need for this type of legislation, so its introduction can only be good news." Claire said in line with the European Convention on Human Rights, there are exceptions for labour that may be necessary to protect public safety and other people’s rights. These include work done while someone is legally detained; military service; emergencies or life threatening situations; and work or service that forms part of everyone’s civic obligations. Martin-Kaye’s Alpha Team offers all-inclusive employment law and human resources advice that can be tailored to suit the needs of each individual business. Shropshire employers are being urged to take a “reasonable” approach when it comes to staff who may be stranded abroad. Lynsey Woolley, from our Alpha Team, said thousands of people had been affected in the last few weeks by the volcanic eruption in Iceland. “The disruption caused by the ash cloud caused havoc with flights coming in and out of the UK, and this week’s problems in Scotland and Northern Ireland have shown the crisis may not yet be over. So it’s important that employers prepare themselves for the possibility that we may yet see more flights grounded, causing even greater difficulties for staff who are travelling abroad – particularly in the run-up to the main holiday season. “The basic legal position is that an employee who is ready and willing to work is entitled to be paid, unless their contract says differently. So employees who may be stranded at home or abroad because of travel problems are considered not able or ready to offer their services, and so don’t have the right to payment. Lynsey said some employers were considering asking their staff to take the time they were stranded as enforced holiday, or may decide to dock their pay. “But of course, this could cause real hostility, and employers should consider staff morale before they go ahead – although doing nothing at all could equally affect the morale of staff who have been left to cover for your absent employee. “You may feel that travel problems are still comparatively rare events, or short-lived, and that it’s not worth introducing a formal policy because of the negative effect it will bring. Why not explore instead how they may be able to continue their duties while they’re abroad – by email, over the internet, or telephone access in an overseas office? Shropshire employees who need to visit their doctor will now be given “fit” notes rather than “sick” notes. And Tina Chander, from our Employment Law team, has welcomed the move as a great step forward in helping businesses to run more smoothly. Tina said the new scheme should allow employees to return to work sooner than they would have previously, and so prevent them from staying off work for long periods of time, which of course interrupts business. “If a doctor uses the fit note option, they will give advice about the effects of the patient’s condition, and suggest the kind of adjustments or adaptations an employer could make to help ease their return. While employers don’t have to act on the doctor’s advice, the fit note may help employers to speed up the employee’s return to work and reduce unnecessary sickness absence. Tina said the company’s obligations to make reasonable adjustments to staff working conditions under the Disability Discrimination Act 1995 would not change. Shropshire manufacturers are being advised to ensure they don’t fall foul of environmental legislation surrounding packaging of their products. “The Government is keen to promote how keen it is on green issues, but it doesn’t make quite so much noise about how much money it makes out of its environmental laws,” said Telford lawyer Graham Davies. Graham, who is our Senior Partner, said: “Its favourite money maker – the speed camera of the environmental world – is a piece of legislation known as the Producer Responsibility Obligations (Packaging Waste) Regulations. The regulations, described by Graham as “really just a paper exercise”, apply to larger firms handling over 50 tonnes of packaging. They challenge businesses to provide evidence of paying for the recovery and recycling of a specified proportion of packaging waste including wood, aluminium, steel, cardboard and plastic. Graham said two of the most recent businesses to be prosecuted for non-compliance had been fined £54,000 and £62,248, and landed with thousands of pounds in legal costs. “Both firms stated that they did not know the regulations applied to them, but clearly the court did not deem this as a defence. The Environment Agency now has teams which monitor businesses, and any business that the inspectors feel PROR apply to, but which hasn’t taken steps towards compliance, will receive a letter. Social networking websites are helping Shropshire employers to research potential employees before they meet them. John Mehtam, our Employment Law Specialist, said: “The social networking phenomenon is everywhere, with more and more people choosing to sign up every day. And now, as well as social benefits, employers are turning to these sites to check out potential recruits. He said the most popular site was Facebook, but many professionals were now turning to LinkedIn (www.linkedin.com), which has more than 55 million members worldwide. John said searching most sites was free and should take just minutes – then if something does show up, you can either ask the candidate to clarify it or reconsider hiring them. Shropshire employees who spend their working day in front of a computer must take regular screen breaks – but do they really need software to tell them that? Tina Chander, from our Employment Team, said some companies had resorted to installing software that prompted staff to take a break. “Difficult as it may be to believe, screen breaks are specifically mentioned in health and safety legislation, and in the official guidance produced by the Health and Safety Executive. The rules say employers must plan their staff’s workload so there are periodic breaks from the computer or changes in activity. But if this doesn’t happen naturally, employers must step in and take deliberate action. “Some computer software companies have tapped into this market developing packages where a message appears on the screen, or some even cause the computer to freeze. But it really is a case of using common sense, and in the vast majority of computer-based jobs, screen breaks will occur naturally,” said Tina. She said employees would probably also find it irritating if they were in the middle of writing an important report, only to be told by their computer they should take a break. 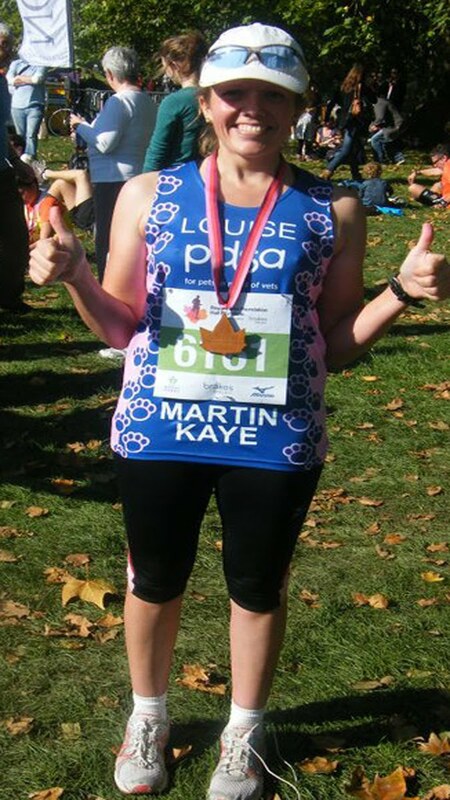 Staff from Martin-Kaye Solicitors have backed an intrepid marathon runner’s efforts to raise cash for charity. Catherine Finn-Bellingham, from Chirk, is running this year’s London Marathon in April, and will be raising funds for Spinal Research. Her niece, Lynsey Kilvert, is one of our Senior Legal Assistants and we have been holding charity events to help boost Catherine’s cash total. 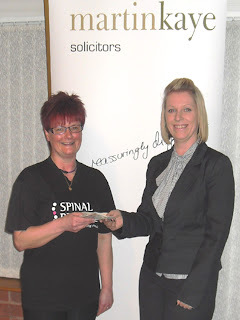 Catherine chose to raise funds for Spinal Research as she has had back problems herself in the past, and also has friends and relatives who have been affected in a similar way. Shropshire employers whose staff are injured on a client’s premises must take care as they could be held responsible. Alison Carter, who leads our Personal Injury team, said even though the accident may have happened away from their usual workplace, the employer could still face a claim. She said the client must protect people against any obvious risks, such as ensuring there were no torn carpets or that there was sufficient lighting. “If your staff regularly have to visit clients’ homes, ask them to complete a home visit checklist themselves – this will identify if there are any potential risks which you can then raise with the client. And if the worst does happen, and a member of your staff is injured, notify your insurers immediately, but don’t admit liability for their accident. Shropshire companies planning building work at their premises must check their contractor’s safety records first. Graham said the Construction (Design and Management) Regulations 2007 meant that the Health and Safety Executive had to be notified in advance of any projects scheduled to last longer then 30 working days, or that involved 500 person days of work. Graham said if your building work qualified as a project that the HSE needed to know about in advance, it was a good idea to take advice on how to meet the health and safety requirements. Employers from across Shropshire will get the chance to hear a run down of the top ten pitfalls to avoid thanks to two local companies. At Martin-Kaye Solicitors, we've joined forces with Turner Peachey Accountants to host an advice forum with a difference. The event will be held on Tuesday, February 23, at our offices at The Foundry, in Euston Way, and it’s the first time our two firms have worked together. Graham said the “top ten” had been chosen by Martin-Kaye’s Alpha team, who deal with a wide range of businesses to help them tackle employment issues. Graham said there had been an excellent response from employers so far, with many signing up weeks in advance for the event. There are still some places available at the free seminar, and interested employers should contact June Noto on 01952 272222 or visit www.martinkaye.co.uk and click on the Alpha logo to find out more. Shropshire staff who are caught using a hand-held mobile phone while driving could cause trouble for their employer too. Tina Chander, from our Employment Law Team, said company bosses should set out strict rules on the use of mobile phones and other gadgets. “Regulations prohibit drivers from using any hand-held mobile phone or similar device while driving, including while a vehicle is stationary in traffic. But you could also find that in theory, as a company director, you could be held responsible if you allow an employee to use a mobile phone while they’re at the wheel on company business. “This could lead to a fine and/or penalty points on your own licence as a result, although the situation has not yet been tested in the courts.” Tina said this was because the regulations also make it an offence to “cause or permit” a driver to use their phone. She said that if staff did not have access to such equipment, companies must make it clear that they must not use any hand-held devices while driving – and a mobile phone and gadget policy should be drawn up. Tina said the rules not only covered sending or receiving mobile phone calls, but also text messages, access to the internet or email, and even checking images on a satellite navigation system. Phoenix companies rising from the ashes of firms which have gone bust are on the increase in today’s tough economic climate. But our Senior Partner, Graham Davies, said starting again may not be so simple. In a civil action, a director could face an unlimited fine and be held personally liable for all the relevant debts of the company that traded under the prohibited name. “But subject to conditions, a director may legitimately be able to reuse the company name,” said Graham. “You can only do this if you have permission from the court; if the successor company has been trading under the prohibited name for 12 months before the old company goes into liquidation; or if the new company acquires all or most of the business of the failed company from a liquidator.